Carl Guse is more than the state’s top expert in public safety communications. He also co-owns a company that bought rights to radio frequencies and later sold them to the state at a huge markup. Guse says he never used his state position to steer business toward his company. This story first appeared in the Sunday edition of the Wisconsin State Journal newspaper. A company co-owned by a state transportation official has done hundreds of thousands of dollars in business with the state - some of it with the official's own agency - raising questions about whether he used his government job for private gain, a Wisconsin State Journal investigation has found. 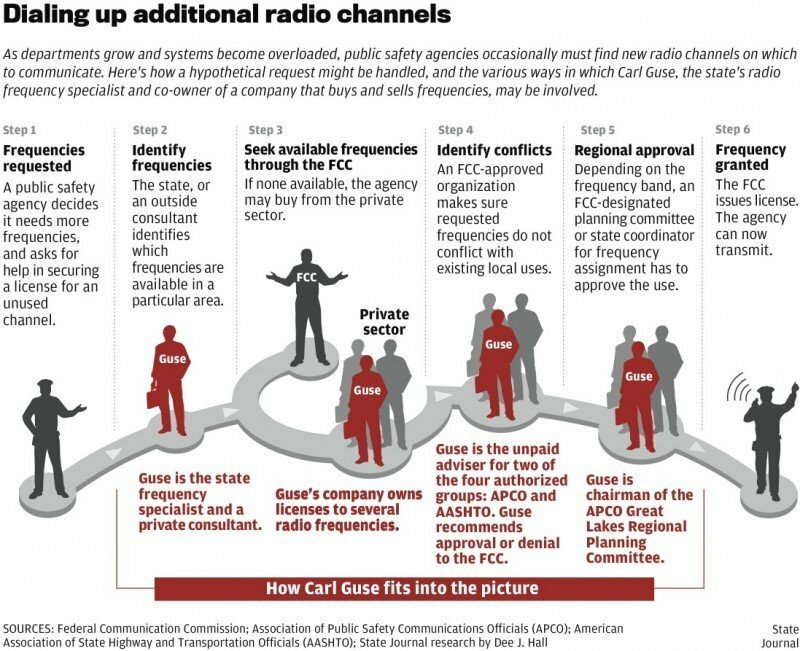 Carl Guse, who manages the radio channels used by emergency responders, and a partner have for years bought rights to frequencies that were later sold to the state, some at an enormous profit. Several experts questioned the sales, saying the type of frequencies the state buys are normally available to public safety agencies for free. Guse's outside work has had the blessing of his bosses at the Department of Transportation, who have made some efforts to insulate him from state purchasing decisions. But it's unclear whether his superiors were aware of the extent to which Guse - privately dubbed by some associates "the god of radio" for his considerable knowledge and expertise in the arcane world of emergency communications - profited from state actions over which he had some influence. The state and a private group charged by the Federal Communications Commission with coordinating public-safety radio frequencies are reviewing Guse's official actions in light of his extensive private business interests. Guse, whose salary is $59,833 a year, has been the State Patrol's frequency specialist since 1997. Robert Jambois, DOT's chief legal counsel, said his agency suspended purchases of frequency licenses last month while he investigates possible ethical problems with Guse's outside business ties. The probe began in March after a Motorola executive raised questions about Guse's potential conflicts of interest, Jambois said. "The purpose of the code of ethics is to ensure ... the only economic benefit I derive from being a state employee is my state paycheck," Jambois said. "I'm not supposed to derive any other benefit, and neither is Carl Guse." But Guse said he and his bosses made "extraordinary efforts" to ensure the relationship between his personal business and state work was "squeaky clean." "I honestly believe I haven't done anything wrong," Guse said. In the wake of disasters such as Hurricane Katrina and 9/11, when firefighters and other emergency responders reportedly failed to receive critical information that could have saved hundreds of lives, the state has sought to coordinate the channels public safety agencies use to communicate. For Wisconsin, that has meant acquiring the rights to available channels from the FCC or buying others from private owners. Since 2003, the DOT and the state Office of Justice Assistance paid at least $877,980 for private radio frequencies. Of that, Guse's company, Badger Spectrum, received $247,500. In most cases, records show, the company bought the frequencies in FCC auctions for as little as $325 each, then resold them to the state two years later for $12,000 each. Guse (pronounced GOO-zee) first disclosed his corporate ties to his bosses in 2001 and began filing forms required of all state employees with outside jobs in late 2003, when the requirement was brought to his attention. The forms are intended to identify potential conflicts of interest. The forms stated Guse could do business with the state only on a case-by-case basis as approved by his managers but prohibited him from competing with the state in buying radio licenses. Michael Eisenbrandt, Guse's business partner in Badger Spectrum, said Guse had no direct involvement in the company's dealings with the state nor the FCC auctions - a position Guse echoes. "I know he talked to his bosses at the state about it, and when the bidding process came up and everything, I was the only one involved," Eisenbrandt said. "I didn't ask him, ‘Is this price OK?' or say boo about it. For all he knows, I could have sold them all for $1 apiece." Eisenbrandt and Guse, 49, formed Badger Spectrum in May 2001 and started buying radio frequency licenses in Wisconsin and elsewhere. Eisenbrandt said they were bought as investments, which the pair expected to sell to two-way radio shops. "To tell you the truth, I had never even thought of it - that the state would even be buying anything," Eisenbrandt said. Eisenbrandt wasn't the only one surprised by the sales. Experts in emergency communications say they're puzzled why the state is buying frequencies on the private market since the FCC already sets aside channels for public safety agencies to use for free. "Based on our review, it's really uncommon for public safety to lease or buy commercially held spectrum," FCC spokesman Robert Kenny said, referring to the range of radio frequencies. He added his agency hasn't heard complaints of any shortage of public safety channels in Wisconsin. Michael Marcus, a Washington, D.C., frequency consultant who worked for the FCC for 25 years, agreed. "It's not the normal thing for state and local governments to be paying for spectrum at all," he said. "There's oodles and oodles of bands already available to local governments." Guse challenged that view, saying, "You're talking to people who apparently don't know what they're talking about. That's a distortion of the situation." He said there aren't enough channels available in the crowded range needed under a project to coordinate radio operations across the state known as WisCom (Wisconsin Interoperable System for Communications). 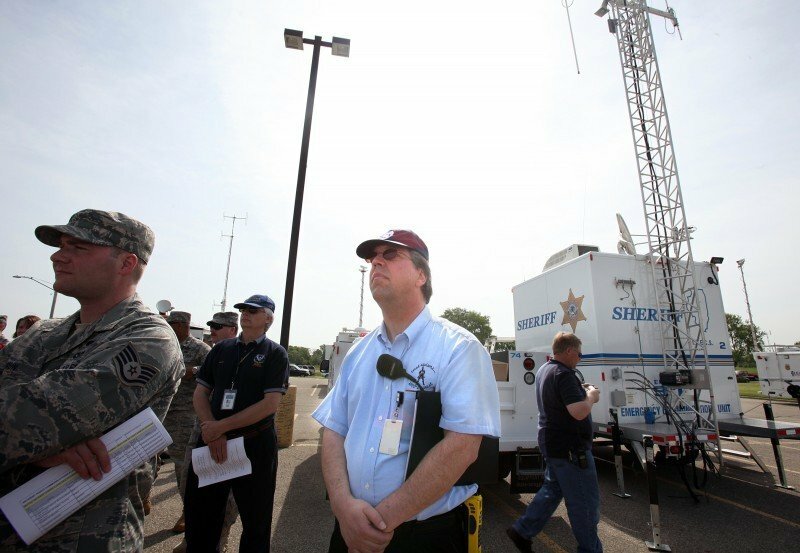 Three-quarters of emergency responders in Wisconsin already use that range, Guse said, and the state needs more than 800 frequencies for WisCom alone. "There are (some) frequencies available from the FCC," Guse said. "I am spending an enormous amount of time securing frequencies from the FCC." Officials in Illinois, Iowa and Minnesota say they aren't buying radio licenses as part of similar overhauls of their emergency communications systems. But Tami Jackson, spokeswoman for the state Office of Justice Assistance, said WisCom is cheaper than other systems in nearby states, which use a different type of frequency and require more towers. "By investing a few hundred thousand dollars to acquire VHF frequencies, Wisconsin is able to save taxpayers millions that otherwise would have to be spent to construct radio towers," Jackson said. Guse said he has never used his state position to steer business toward his company and has "not been a part of decisions to purchase frequencies from private entities." But documents obtained under the state's open-records law show he played a key role in helping the state acquire private frequency licenses, even as his business continued dealing in the market. Guse first recommended that the DOT try to buy frequencies in an FCC auction in 2001, Jambois said. Guse's former boss, David Hewitt, declined, saying he didn't see the need for additional channels. But Hewitt, then director of the State Patrol's Bureau of Communications, allowed Guse to participate in the auction as a private business owner. In 2003, citing a need for additional channels for the mobile data terminals in State Patrol squad cars, the DOT decided to buy frequencies normally used by cell phone companies and businesses that communicate by two-way radio. Guse insists he played no role in that decision. But he acknowledged he did identify for Hewitt which frequencies were needed. The state again opted not to buy the frequencies at a 2003 FCC auction, which Hewitt said "did not fit into the state procurement process." Instead, it solicited bids from companies - including Badger Spectrum - that had. E-mails show Guse participated in early planning for that solicitation for bids even as his company was preparing to scoop up frequencies at auction. In mid-May of that year, while the auction was still ongoing, Guse was suddenly excluded from preparing the solicitations for bids to avoid a conflict. That request ultimately resulted in $79,500 in business for Badger Spectrum, records show. Hewitt said Guse was shielded from decisions about which frequencies to buy, and from whom, saying he personally selected channels that would be "the best value to the state, without any knowledge of which bidders had been selected." "Legal counsel advised that as long as Mr. Guse had nothing to do with the state frequency procurement or the awarding of selected frequencies, his private business interest could respond to the procurement," Hewitt said. That legal counsel, Joe Maassen, now retired, recalls saying whatever the department did, "you better be sure it passes the smell test." Among the questions Jambois is now trying to answer: Did Guse use his knowledge of the state's needs to benefit his company, which sold the frequencies to the state for more than 30 times what it paid for them? "I harbor the suspicion that there is a possibility that because of his expertise as a frequency specialist, (Guse) knew which ones to bid on ... and what value to place on his frequencies," Jambois said, adding, "Most people don't make that kind of return on their investment." Records show Guse also was instrumental in planning WisCom, the $20 million emergency communications project that last year bought $168,000 in frequencies from Badger Spectrum. Guse now is the project director for the main federal grant that's funding equipment for WisCom. E-mail correspondence shows Guse joined in decisions about the project including which frequencies to acquire first and how much the state should pay. Some of those e-mails included direct communications between Guse and his business partner, Eisenbrandt. Jackson said the Office of Justice Assistance, which oversees WisCom, only recently learned of Guse's involvement in Badger Spectrum. She said the agency is cooperating with the DOT's ongoing investigation. In accepting federal Homeland Security grants for the project, the state has to certify it has safeguards in place to prohibit employees from using their positions for personal gain and from presenting even the appearance of conflict of interest. The Association of Public-Safety Communications Officials, a private group, also is investigating Guse's commercial holdings after learning of them from the State Journal. Guse is the volunteer frequency adviser for APCO, one of the groups the FCC has certified to coordinate use of radio frequencies by public safety agencies in Wisconsin and nationwide to prevent interference among users. Mark Cannon, deputy executive director of the Daytona, Fla.-based organization, said frequency advisers such as Guse are required to file forms disclosing any conflicts. "We have none on file from Carl," he said. Cannon said Guse, who's worked as an APCO volunteer for 18 years, told an association official his business ties don't conflict with his role as adviser because the licenses Badger Spectrum owns are typically for commercial use. In 2008, the DOT again solicited bids for radio frequencies from Badger Spectrum and other companies. That's when Elm Grove businessman John Aegerter cried foul. Aegerter, who owns VHF radio licenses and three communications companies, declined to sell any of his frequencies, then complained in a letter to Attorney General J.B. Van Hollen about Guse's potential conflicts of interest. Aegerter questioned why Wisconsin was buying licenses at all. And he was critical of Guse's multiple roles as public official, frequency regulator and private business owner. Van Hollen declined to investigate, saying in a letter that he could see possible violations of state employment or bidding rules - but no crime. In a letter to Aegerter, he said he was referring the matter to Jambois, who said his agency can find no record of it. "I just think it was a shady deal," Aegerter said. Contact Dee J. Hall at dhall@madison.com or 608-252-6132; contact Mary Spicuzza at mspicuzza@madison.com or 608-252-6122. Unlike the state of Wisconsin, Dane County recently decided against purchasing radio frequencies from a public safety official involved in planning its emergency communications system. The Wisconsin Department of Transportation has asked another agency to review whether one of its employees whose company profited from sales of radio frequencies to the state has a conflict of interest. State worker’s private company profited from sales to his state agency. The appearance that the state’s radio frequency expert could gain from the sales makes the practice inappropriate, ethics review says. Carl Guse, Wisconsin's top radio frequency expert, will have to choose between his private business interests and his state job, the Department of Transportation's general counsel said Thursday. During much of his 13 years in state government, Carl Guse has built up a network of private companies that are closely tied to his role and expertise as the state's radio specialist. Badger Spectrum, Ltd., which buys and sells radio frequencies. The company bought 89 licenses at Federal Communications Commission auctions in 2001 and 2003 for a total of $52,468. In 2003, 2004 and 2008, the company sold at least seven of those to the state Department of Transportation for $79,500. The state Office of Justice Assistance bought 10 more licenses from the company in 2009 for a total of $168,000. Badger Towers, LLC, which owns at least 11 communications towers around Wisconsin. The company leases space only to private clients, said Guse, a co-owner. Badgerland Communications, Inc., which sells two-way radios and other communications equipment to public-safety agencies and others. Guse said he ended his 25 percent stake in the company in 2003. CRG LLC, which owns and operates a Watertown facility that boosts the signal of a religious radio station in Port Washington. Guse said CRG has done no business with the state.